Autogenous bone is needed for the reconstruction of defects or to correct cosmetic deformities. Along with the tibia, fibula, scapula, and ribs, the iliac crest is among the most common donor sites for autogenous bone. It can furnish extremely large grafts, which are usually taken in the form of compound or composite flaps that include soft-tissue elements (see Fig. 14.2). Indications: Cancellous bone chips are used as filling material for mandibular reconstructions and bone cysts, and composite corticocancellous grafts of various sizes are used to correct facial contour deformities, augment the nasal skeleton, and replace portions of the mandible (Fig. 15.3). Position: The patient is placed in the supine position with the hip (generally the right one) elevated on a cushion. Approach: The somewhat thicker portions of the iliac crest (approximately 1.3-1.7 cm in diameter) are located in the anterior third between the anterior superior iliac spine (Fig. 15.1a, 3) and the iliac tubercle (Fig. 15.1a, Tub). The iliac spine is preserved anteriorly. An assistant presses down on the skin medial to the iliac crest so that the incision, and later the scar, will be lateral to the site where the bone graft is harvested. The incision should not be carried anteriorly past the iliac spine to avoid injury of the lateral femoral cutaneous nerve, as this would cause anesthesia or hypesthesia on the anterolateral thigh (Fig. 15.1b). The incision over the anterior iliac crest extends through the skin and subcutaneous tissue down to the periosteum. The length of the incision depends on the length of bone graft that will be removed. Harvesting cancellous bone (Fig. 15.2): The periosteum is first incised along the lateral edge of the iliac crest. Then it is incised transversely behind the iliac spine and anterior to the tubercle, and the bone is divided transversely with an osteotome to a depth of about 0.5 cm (Fig. 15.2a). On the lateral side, the upper portion of the iliac crest is divided with a straight osteotome and fractured on the medial side. This forms a cortical cap that is hinged medially on the periosteum and attached muscles and can be opened like a trapdoor to expose cancellous bone (Fig. 15.2b). The straight osteotome is advanced down along the inner surface of the inner and outer tables of the iliac crest, and a transverse osteotomy is made behind the spine and in front of the tubercle. An osteotome curved on the flat is then used to cut through the base of the cancellous block (Fig. 15.2b). Harvesting of the cancellous bone is followed by meticulous he-mostasis in which bleeding sites in the bone are first cauterized and then occluded with fibrin glue or bone wax. 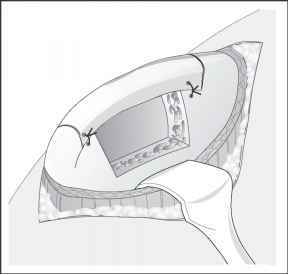 The outer and inner tables may be fractured toward each other slightly to reduce the size of the donor cavity. The cavity is packed with blood-soaked fibrin foam or collagen sponge, for example. The cortical cap is returned to its original position, the periosteum is reapproximated with sutures, and the wound is closed in layers. Suction drainage is essential to prevent hematoma formation. Two continuous suction drains should be used. One is placed at the bone graft donor site, maintaining suction for only about 30 minutes to prevent excessive blood loss; the other is placed in the soft-tissue mantle, where suction is maintained for 2-3 days. The can-cellous bone can also be harvested with sharp curettes. Harvesting corticocancellous bone (Figs. 15.3 and 15.4): Corticocancellous bone can be obtained from various regions of the iliac crest, depending on the necessary graft size (Fig. 15.3). 1. Small grafts (Fig. 15.3). The border of the iliac crest is an excellent donor site for small grafts used to reconstruct the nose, orbital ring, or facial contours. The periosteum is incised along the center and dissected from the inner and outer tables according to the necessary graft size. The graft is harvested with a straight osteotome or saw (Fig. 15.4a). After meticulous hemostasis, the periosteum is closed with ab-sorbable sutures, and the wound is closed in layers over a suction drain. 2. Larger corticocancellous grafts (Figs. 15.3 and 15.4). 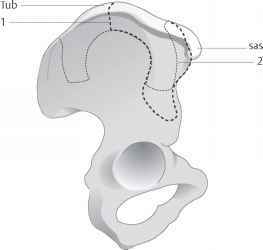 The desired graft size will determine whether it is necessary to strip the medial periosteum with the iliac muscles, the lateral periosteum with the attached gluteal muscles, or the periosteum on both sides. The inner table is easier to expose, and larger corticocancellous grafts should be taken from the inner table whenever possible (Fig. 15.4b). This leaves the outer table with the gluteal muscle attachments intact. The anterior superior iliac spine with the tensor fasciae latae attachment should also be preserved. 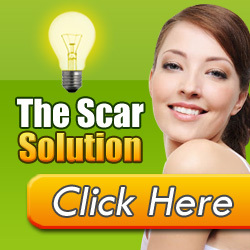 The grafts can be harvested with straight and curved osteotomes or with a motorized saw. a The periosteum is incised laterally, and the iliac crest is raised with an osteotome, leaving it hinged medially on periosteum and muscle. b With the cortical cap opened, a straight osteotome is driven along the inner and outer tables of the iliac crest, and a transverse osteotomy is added to free the cancellous bone block. Fig. 15.1 Iliac crest bone graft. a Position of the patient. Pressing down on the abdominal wall draws the skin medially across the iliac crest, positioning the incision and scar lateral to the crest. The diagram shows the inserting muscles, which are partially detached along with the periosteum. (sas = anterior superior iliac spine; Tub = iliac tubercle) b Sensory nerve supply of the leg (in the standing patient). 6 Inguinal ligament (sas = anterior superior iliac spine; S = incision). Fig. 15.3 Harvesting of large two-layer and three-layer grafts. 1 Graft for hemimandibular reconstruction. 2 Graft for anterior mandibular reconstruction (sas = anterior superior iliac spine; Tub = iliac tubercle). (Today this graft has been superseded by the fibular graft or pedicled iliac crest graft, see Fig. 14.2). After the desired grafts have been obtained, the bone edges are rounded off with burs, rasps, or ronguers. 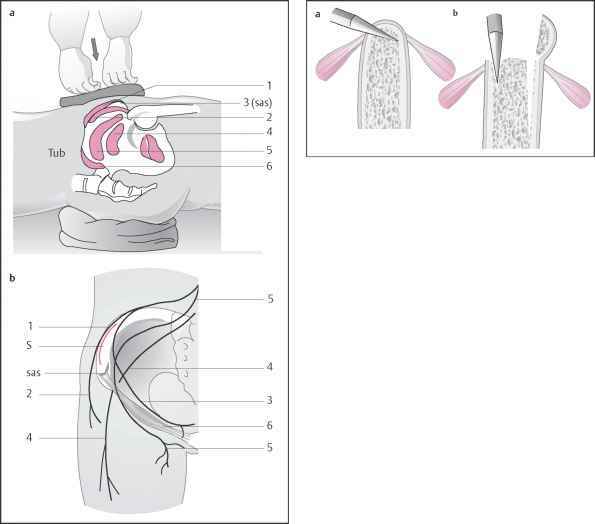 A three-layer (full-thickness) corticocancellous graft can also be harvested, and again it is recommended that the superior border of the iliac crest be preserved (Fig. 15.5). In selected cases bone from the posterior iliac wing can also be used. Hemostasis: Heavy bleeding, especially from the cancellous bone, requires meticulous hemostasis. This can be accomplished with bone wax and suction drainage (see above). Donor cavities are packed with blood-soaked fibrin foam or similar material. Blood loss in excess of 500 mL is not unusual. a A small cortical bone graft is obtained from the iliac crest after stripping of the periosteum. The anterior surface of the iliac spine should be preserved (tensor fasciae latae). b A two-layer graft (dotted line) is taken from the inner table after periosteal stripping. The anterior surface of the iliac spine should be preserved. Fig. 15.5 A three-layer corticocancellous graft has been removed with preservation of the iliac crest, which is reattached after graft harvest. The iliac crest segment should be slightly larger than the graft. Wound closure: The wound should be closed in layers. When large bone grafts have been obtained, the iliac muscles can be sutured to the gluteal muscles over the iliac wing, and the medial and lateral periosteum are sewn together with heavy sutures. How much corticocancellous bone can be harvested from anterior hip.? Can satorius muscle be injured in a iliac crest harvest? How much bone can be harvested from anterior iliac crest? How is iliac bone harvested for a bone graft?